When we first learned that chemo was a certainty as part of Andrea’s breast cancer treatment program, it quickly became the beast I feared — more so than the three surgeries Andrea had and the radiation and hormone therapy that still lie ahead. 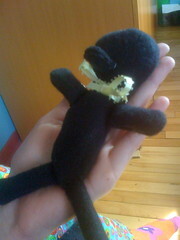 The fear kept me up at night for weeks. It seems almost impossible now to believe that Andrea has only one more round of chemotherapy to go. It feels in many ways as though we’re about to slay the beast with a final lunge. Which brings us to the parade and the bell of hope. We first learned about the parade during Andrea’s second chemo. We observed a small group of nurses fussing over a seated chemo patient opposite Andrea. When the patient stood up and started walking away, the nurses fell in behind and clapped as the patient made his final journey out of the chemo clinic. It was an emotionally uplifting moment. To date, however, we have not heard the ringing of the bell of hope, an honour afforded to chemo patients who have completed all of their chemo treatments. 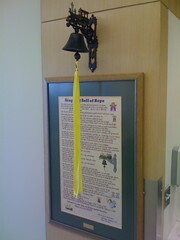 The bell hangs on the wall above an embroidered poem by a cancer survivor. It’s a poem of fear, love, strength and hope. It’s inspiring, as is the idea of ringing the bell. Which makes me wonder why we’ve heard a few parades and never the bell. When Andrea gets up to leave the chemo clinic for the last time in the afternoon of April 1, I want everyone to hear that bell. To me, the bell isn’t just about Andrea soldiering through one of the most difficult physical and emotional beatings medicine can throw at a person, it’s about honouring everyone who’s been through this process and thanking the loved ones and support networks that stand by them. It’s about celebrating the courage and strength of the patient. There’s still the potential of a rough recovery from this round, though we’re hopeful that a new side-effects management plan will make the recovery process for this round better than the last. Then, in three week’s time, that bell will sing its song for the chemotherapy unit and everyone in it. It will be sweet music and I’ll be there with every piece of technology I can carry to capture the moment, preserve it and share it. And if I’m allowed to ring the bell as a supporter, every fibre of my being will go into ringing that bell for everyone who has been and will be through this process — the patients, loved ones, friends and the amazing volunteers, pharmacists and nurses. I just hope the anticipation doesn’t keep me up at night. No personality causes disease. So there’s no cancer personality. However, there are some common traits that, if they are present in exaggerated degrees, will make you more predisposed to the disease. They don’t cause it, but make you more likely to get it because they increase the amount of physiological stress you’ve got inside you. So people who don’t know how to say no, people who are rigid and compulsive, perfectionistic, expecting themselves to be perfect in everything, people who don’t know how to express their experience of anger in a healthy way, people who compulsively and automatically take care of others and don’t think of their own needs, these people are physiologically stressed, whether they know it or not. So it’s not that the person causes the disease. Stress is the thing that leads to disease or leads to conditions for it, but certain personalities are more prone to this stress. Because their boundaries will be invaded but they won’t know it, they’ll be extending themselves and they won’t know it, they will work when they should be resting. So only in that broad sense can you speak of personalities, not in the sense that a particular personality causes a particular disease. Lots of studies show that people who are sunny and positive die quicker of their disease. If you’re a woman with breast cancer and you’re a positive thinker, you’re guaranteed to die much quicker. Do check out this excellent (2-part) interview with Dr. Gabor Mate discussing psychoneuroimmunology here. There’s also a thought-provoking (3-part) IdeaCity04 talk by Dr. Gabor Maté here.